It was more than 40 years ago at the age of 15 that I was first exposed to the world of bicycle racing. During the summer of '69 I had the great fortune to study in Grenoble, France, where I watched the Tour de France as it descended Alpe d'Huez. Not only did Eddy Merckx take the stage but it was the year that he took his first yellow jersey. Since then, it's been in my blood. 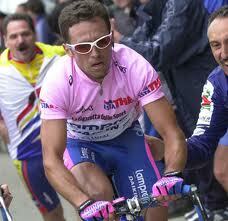 Years later I would come to love the Giro d'Italia even more. Eleven years ago, in 2001, I escaped New York City for a serious bike tour in Italy that followed the last 5 stages of the Giro d'Italia. Not only did it solidify my love for cycling and for Italy, but it eerily turned out to be a pre-vision of my future. Here is the article I wrote 11 years ago which was published in the New York Cycle Club monthly newsletter. I dug it up today and read it for the first time in many years. Following the 2001 Giro d'Italia. Three months later, all my dreams including this one, came to an instant halt by the event of Sept 11. Thrust from my home in the shadow of the World Trade Center, I was in survival mode for the next 5 years, struggling to regain my sanity and the few pieces of my life that still remained. Of the material things, I was lucky to salvage a few pieces of furniture, a plant, and the documents on my hard drive, which included the article above. Well, this dream as well as many other ones came true. I never would have imagined that today, I would be living in Tuscany, watching the Giro d'Italia pass through my own backyard. I never dreamed that I would discover that I've been an Italian citizen all my life and never knew it. Italy's been calling me for a long, long time. Tomorrow, I'll be joining thousands of cyclists from all over Tuscany to follow Stage 11 of the Giro d'Italia. Finding the article that I wrote 11 years ago made me think of how I have not only survived the aftermath of September 11th, but how I have thrived and have become a stronger person with a newly founded spirit. A spirit that has found the environment where it thrives the best. And how grateful I am to be alive and living out my dream in Italy.